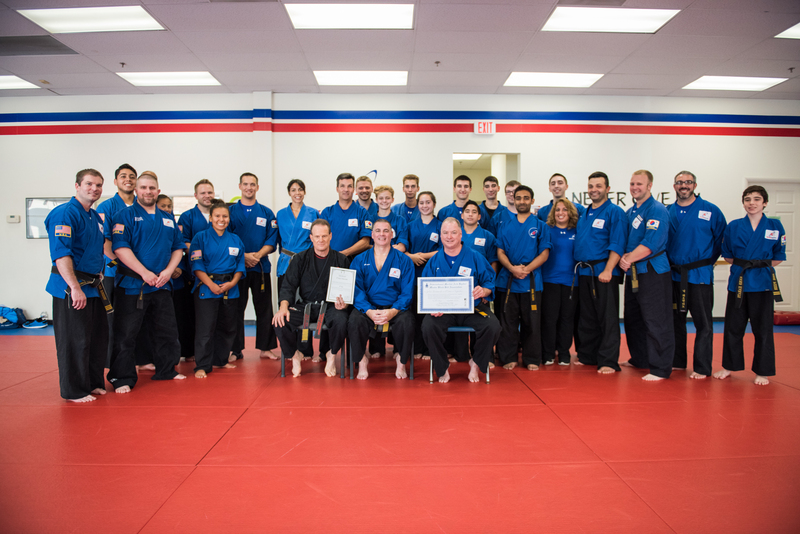 Our CEO and head instructor, Master John Bussard recently earned his 8th degree black belt. 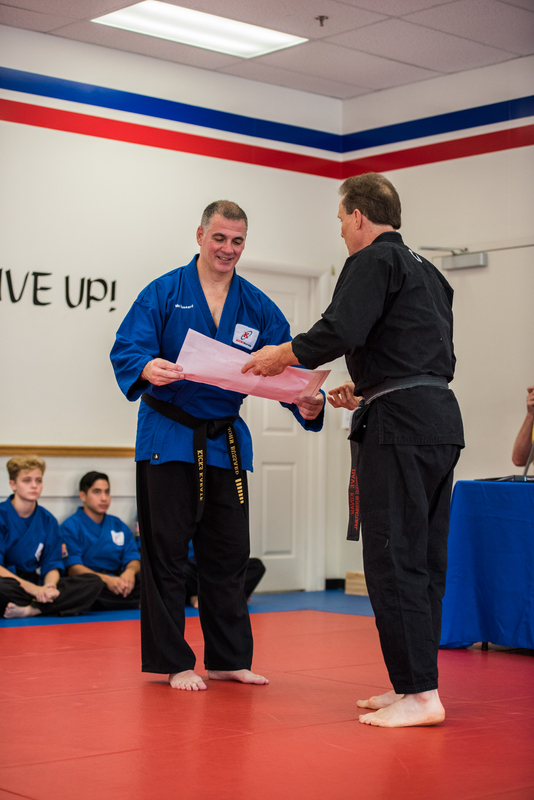 His many years of martial arts training, discipline, and teaching has led him to this great honor, and everyone at Kicks Karate is proud of his hard work and high achievement. To celebrate his grand accomplishment, a celebratory ceremony was held at the Kings Farm Kicks Karate Family Martial Arts Academy. Master Bussard performed a precise form and delivered a remarkable speech discussing his journey to this point and how his work toward his recent achievements have changed the way he lives his life. Welcome everyone, it is an absolute honor to be here in front of you this afternoon. So thank you again for taking the time to be here. There are a lot of things I could talk about today. For example, I could talk about all of my personal achievements in the martial arts, the years training at Kim Studio under Grandmaster Ki Whang Kim, the trophies, the grand championships, awards, honors, halls of fame, etc. but no one really wants to hear about all that stuff, so I’ll skip it. 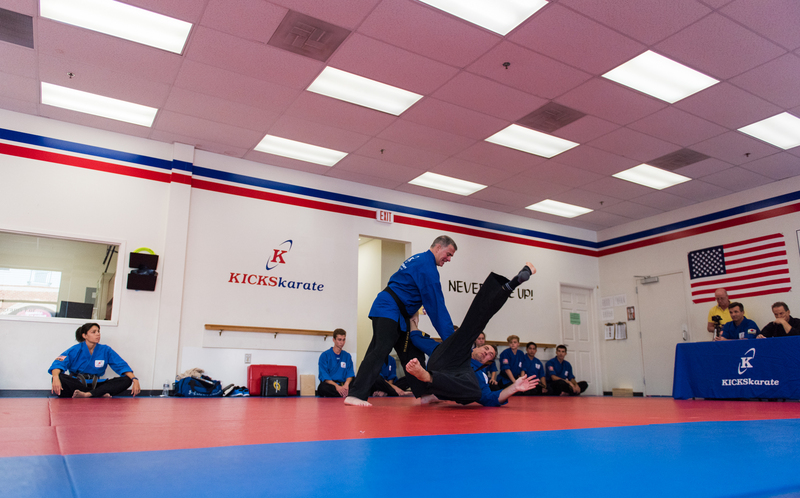 And then I thought I might want to talk about the Kicks Karate staff and team, the people who’ve built Kicks Karate into what it has become. The instructors and key personnel, people Jim Dofflemyer our COO, my wife, and our operations manager Lana, the people behind the scenes like Stefanie & Lauren. The incredible managers we have who make this all possible. Instructors like Mr. Lee and Mr. Daniel who I’ve known since they were little kids, who I’ve watched mature and blossom into great martial artists and leaders… people like Mr. Brown, Mr. Gray & Mr. Ricky who I’ve literally known and trained with for well over 30+ years, how valuable they’ve been as part of our team. And, of course, the hundreds of other blue top instructors who have contributed to our success… but honestly, I don’t want to talk about that today either. And what about the students? Perhaps I could talk about the fact that we’ve taught tens of thousands of students, and promoted several thousand of those students to the rank of black belt and beyond. The positive impact we’ve had on those student’s lives, the impact we have on the cities, communities, and neighborhoods in which we all live… but nah, I’m not going to talk about that today either. Or, maybe I should talk about Kyoshi Kovar, and how he has been a mentor, an inspiration, a trusted advisor and friend. 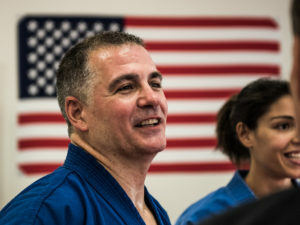 I could discuss his amazing achievements, his passion for training and teaching, the fact that he has earned the rank of black belt in no less than 10 different martial arts disciplines, that he’s a lifetime achievement award winner, a world famous instructor, that he is known as “the teacher of teachers” … and yet, he is so humble he doesn’t ever talk about those things, and I certainly don’t want to embarrass him, so I won’t talk about them today either. Finally, I thought, maybe I could talk about how at the youthful age of 52, I decided to go back to school. Not just to any school, but to THE Harvard Business School. How to my surprise, I got accepted, and even graduated from their exclusive Program for Leadership Development, to become an alumnus of the most prestigious business school in the world earlier this year. How it ultimately led me on a journey of self reflection and discovery, to become a better business person, and a better leader… but, it was ONLY Harvard… so I’m not going to talk about that today either. Well, by now, you might be thinking, OK, well if ole’ Mr. Bussard doesn’t want to talk about any of that stuff today, what does he want to talk about? The answer to that is right up here on this wall, our slogan… Never Give Up! Where did that slogan come from? It was the early 1940’s and W.W.II was in full motion. Winston Churchill was the prime minister of Great Britain at the time and Adolph Hitler and his Nazi Army had already invaded and taken over much of Europe. Poland, France, Belgium, Denmark, Netherlands, Greece and others were all occupied one after another. Hitler knew that his key to victory and winning the war, at least in Europe, was to defeat Great Britain, who was a major superpower in that part of the world. The Germans developed a strategy to try to strangle Great Britain. They used their U-boats to seize control of the shipping lanes around Great Britain, cut off all the supply lines, and left the people with little food or supplies. On top of that, German planes harassed them from the skies, dropping hundreds of bombs per day on the cities and people of Great Britain. Great Britain’s morale was at an all-time low. Word spread throughout the country that their great leader and Prime Minister, Winston Churchill was going to make a speech. The people didn’t know what to expect. Were they giving up? Were they surrendering? Throughout Great Britain, people gathered around radios, which was one of the few ways of mass communication in those days, and waited to hear what Churchill was going to say. They feared the worst, that this may be the end, …and then Churchill got on the radio and said these 5 words… Never, ever, ever give up! His short speech galvanized the people, rallied them together, and the Brits, along with the other allies, fought back and eventually won the war! And that is where our “Never Give Up” slogan came from. Now Churchill is quoted as saying, “Never give in. Never give in. Never, never, never, never—in nothing, great or small, large or petty—never give in, except to convictions of honour and good sense.” But this was part of a speech that took place after the war, at his boarding school, to a group of young students. You see, back in the 80’s we didn’t have Google, or the internet… we had Encyclopedia Britannica, so we took the lecture for what it was and never questioned it. I don’t know what the moral of the story is, maybe it is don’t believe everything you hear? Or maybe, just maybe, it is that if you believe it, you can definitely achieve it! Whether Winston Churchill said those exact words doesn’t really matter to me, the truth is Grandmaster Kim told this story to me and it inspired me. He used these words to motivate me… I believed them… I believed in what they stood for… and the “never give up’ attitude has served me well and continues to lead me to extraordinary heights!